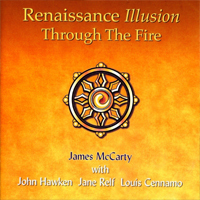 “Through the Fire” amply retains the core values of the original RENAISSANCE albums and those of ILLUSION in the late ’70s merged with Jim McCarty‘s own tender idealism and spirituality. The main difference from his official solo albums is the presence of most of the contingent from those 70′s bands as backing musicians. While JANE RELF sings backup, this 2001 reunion also features JOHN HAWKEN‘s mellifluous keyboards, chiefly piano. These elevate the effects of every song and add a progressive footprint to this melodic soft rock album. The consistency of McCarty’s vision is beguiling, as he tenderly imparts every message in a manner that bears consistent rewards every time one listens, whether actively or passively, with headphones while drifting off to sleep, or perhaps with someone special.